Joseph Borg: The Ħ’Attard Village Core – A Walking Tour of Dis­covery. Attard council, 2013. 47 pp. Attard is one of three attractive villages grouped together in central Malta, the other two being Lija and Balzan. All three of them were already in existence early in the 15th century, and during the rule of the Order of St John they became favourite spots for wealthy people to build second homes. The building of San Anton Palace in the 17th century in the Attard-Balzan area must have attracted prestige-seekers to build their mansions, with large gardens in this area. 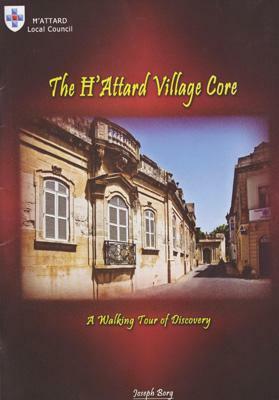 The whole area is a most pleasant place to walk, and Borg’s small, but nicely-produced booklet will certainly be found useful by those wishing to explore the village core of Attard, with its handsome old houses, fine parish church and numerous relics from the Order of St John and early British rule. As this area is far from huge, Dr Borg has designed his publication as a circular tour starting at the early 17th-century parish church of the Assumption of Our Lady (1610-1628) and ending there. Attributed by some critics to Tommaso Dingli, with others believing the original design to be by Vittorio Cassar, the church is smallish and exquisite, with a beautiful façade adorned with sculptures, and an interior notable for its elegance. This is one of a handful of renaissance churches in this country, and greatly deserves to be visited. Not far from the church are two fine houses, Villa Barbaro and Casa Bonavita, both built in the 18th century. Villa Barbaro, according to tradition, was where the Maltese insurgents against the French in 1798 met to draw up their initial plans of attack. The Bonavita family, on other hand, whose archives were deposited in the University library 50 years ago, was very Francophile. Other Attard houses of interest are Villa Caruana Gatto, formerly the residence of a well-known bota­nist and lawyer, Alfred Caruana Gatto, and the hand­some Villa Bo­logna, built in the late 18th century and now belonging to the Strick­land family. It has a magnificent garden. Villa Bologna is in San Anton Street, fairly close to the back entrance of the presidential palace of San Anton, one of Malta’s best-known public buildings. It was built by the 17th-century Grand Master Antoine de Paule, and embellished and enlarged in the following century by Grand Master Antonio de Vilhena. De Paule was a worldly man. He not only had a mistress, Flaminia Valenti, but also set her up in a grand house, still there to be seen and well depicted in the book, in San Anton Street, with easy, private access to the palace grounds. Borg’s book mentions and gives brief information about all the interesting sights in the village. These include a small museum of the Malta Railway’s history, the Wignacourt acqueduct, the 20th-century house where the out­­­­standing Maltese artist Emvin Cremona lived his last years, street shrines, fountains, and what is probably the largest public building in the area, Mount Carmel Hospital in Mdina Road, though this is not strictly within the village core. Borg provides a good map, and plentiful illustrations. My regret is that the sights noticed in the book, all of which have a number relating them to the relative illustrations, do not have a corresponding number on the map, and that there is no alphabetical index of sights. The publication, however, is certainly worth having. Dr Borg is the author of numerous articles and books about Maltese agriculture and the Maltese landscape. They include a number of companions to countryside walks in Malta.